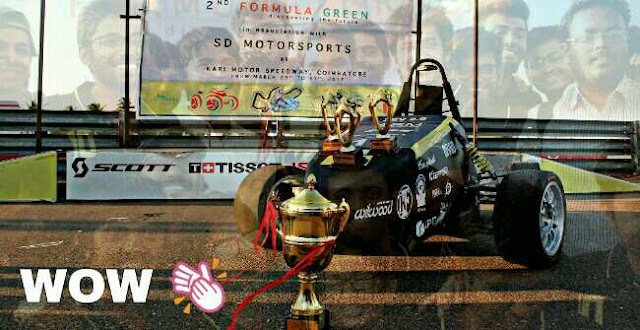 4ze Racing is the Official Formula Student Electric Racing team of SRM University. The team participated in "2nd Formula Green" 2017, a National level Formula Electric competition that was held at Kari Motor Speedway in Coimbatore from 29th to 31th March 2017. The Competition was divided into Static and Dynamic events. Static events include Design Evaluation, Cost Analysis and Business Plan. Dynamic Events include Acceleration, Skidpad, Autocross and Endurance. Nine teams participated in the event, participating team were from IIT Roorkee, VIT Vellore, VIT Chennai, Sri Sairam College of Engineering, PSG Institute of Technology and Applied Research, SSM Institute of Engineering and Technology, KIIT, SD Institute of Technology. For more details about the team 4ze Racing please vist http://www.4zeracing.com. A small writeup by Harsh. We wish him a great career and life ahead. This is Harsh Agarwal, son of Mr Binod & Mrs. Naina Agarwal and the team captain of 4ze Racing. I belong to the city of Kurseong(Darjeeling), where my father works as a Tax Consultant and Account(L.I.C). Currently i am in the final year of my B.Tech program in automobile engineering at SRM University Chennai . My team "4ze Racing" is a Formula Electric Racing team representing SRM University. Here a group of around 30 under graduate students design, fabricate, and test electric formula race cars.These race cars are buily every year and showcased in competitions like FSAE and Formula Green. This year we geared up for the Formula green event organised by ISNEE(Indian Society of New Era Engineers)which was held from 29-31st March. Representatives from 9 different universities of India had participated in the event. After all the long nights and tough races, at the end of the three days, we were crowned the National Champions! A feat our team has worked hard for, and every member truly deserved. All I can tell you about me is that my passion for cars extends further than where feet can reach, so i chose wheels instead. Everyone knows the adrenaline rush in racing a car, but only a few get to feel the rush of building one. From the core to the final touches, every car we made has been an adventure on its own. The late nights and long hours were all dedicated to this one goal, and it feels amazing to achieve it.